This article is about the island in Cork Harbour. For the lighthouse in Carlingford Lough, see Haulbowline Lighthouse. 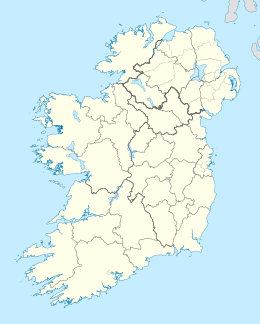 Haulbowline (Irish: Inis Sionnach), is the name of an island in Cork Harbour off the coast of Ireland. The world's first yacht club was founded on Haulbowline in 1720. The western side of the island is the main naval base and headquarters for the Irish Naval Service, with the eastern side previously used for heavy industry. Since 1966 the island has been connected to the mainland by a roadbridge. The island's name may derive from Old Norse ál-boling or similar = "eel dwelling" ("area where there are conger eels"). The 17th and 18th-century spellings end in "-ing"; there may have been nautical influence on the spelling later. The Irish language name for the island, Inis Sionnach, translates to "island of the fox". At a strategic and deepwater position in the harbour, the island has long been a military base. The island was first fortified in 1602, and initially an important base for the British Army. In 1603 the Cork city fathers were accused of attempting to demolish it, and William Meade, the Recorder of Cork, was charged with treason as a result. 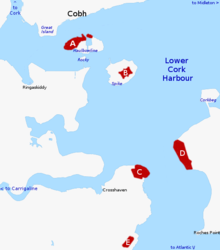 In 1720, much of the island was owned by the Cork Water Club, later connected to the Royal Cork Yacht Club (claimed as the world's first yacht club). There was a castle on the island which was the clubhouse for the Cork Water Club. An Ordnance Yard was established on the westernmost part of the island, separated from the rest by a large stone wall. A Martello tower was built for defence, and in 1808 a pair of magazines were erected on nearby Rocky Island with capacity for 25,000 barrels of gunpowder. East of the wall a Victualling Yard was laid out, and from 1807-1824 a series of buildings were constructed, several of which are still standing. Most prominent are six large Storehouses, three grouped together around a quay on the north side of the island, and three along what was then its eastern edge. Behind these was a large rectangular rainwater tank (which collected fresh water for the ships), on top of which was a quadrangular cooperage complex. To the south were a mast and boat store, at the top of a slipway, and to the west, along the length of the wall, were cottages and houses for the workers and officers of the yard. At this time, some 4 acres (2 ha) was added to the island through land reclamation, the first of several such additions. Remarkably soon after so much investment, the Navy announced the closure of the Yard in 1831; ten years later, though, it reopened. The next major development came in the 1860s with the establishment of a Royal Navy Dockyard on Haulbowline, for warship repair and construction. To accommodate this new industrial complex the island was doubled in size to a total of around 60 acres (24 ha). The large basin was constructed, which today bisects the island, with a 408 ft (124 m) dry dock at one end (extended to 600 ft (180 m) just prior to the First World War). By the 20th century, the (now renamed) Royal Alexandra Victualling Yard area also contained a coaling/fuelling depot, as well as a Naval hospital (housed in one of the Storehouses). Unlike the other fortifications in Cork Harbour, which formed part of the treaty ports, the dockyard was handed over to the Irish Free State in 1923, and remains the main naval base and headquarters for the Irish Naval Service. The majority of the Naval Service campus is on the west of the Island - much of it within the former Ordnance Yard – save for the service's football pitch which was reclaimed from land on the eastern side in the 1980s. In September 2014, the Minister for Defence Simon Coveney announced plans for a €50m upgrade of the naval base with improved quays to cater for the Naval Service's new ships and the construction of a runway to enable the Naval Service to operate UAV drones. In March 2008, one of the historic 19th century industrial storehouses on Haulbowline Island was destroyed by fire, leaving only its walls still standing. Irish Steel (later known as Irish Ispat) was based on the east of the island, on the site formerly occupied by the 1869 Dockyard, between 1938 and 2002. During this time, waste products from the steel making process were dumped or stored on the site, and radioactive and Chromium 6 contamination remained in the soil after the plant closed. The contamination from this period of industrial use has been cited as a potential impact to the future development of the island, and campaigners, including Erin Brockovich, had requested government action on the contamination issue. The island's 'East Tip' is made up of slag and other waste material from the plant; it added a further 20 acres (8 ha) to the size of Haulbowline Island. In July 2006, it was announced that the former steel plant site would be developed with apartments, offices, a hotel and a marina. However, this plan was shelved when the celtic tiger came to an end in 2008, until plans publicised by the Department of Agriculture and the Marine in 2014 anticipated the upgrading of the island's road bridge, to facilitate the clean-up of the site, for possible redevelopment as a park. Originally estimated at €40m, the cost of the clean-up and redevelopment was later updated to at least €61m, and (as of late 2016) queried for its suitability. Wikimedia Commons has media related to Haulbowline. ^ a b "National Inventory of Architectural Heritage – Haulbowline Island, East Cork". Buildingsofireland.ie. ^ "The Island Crematorium - History". Islandcrematorium.ie. Retrieved 28 February 2017. ^ a b c d Coad, Jonathan (2013). Support for the Fleet: Architecture and engineering of the Royal Navy's bases, 1700-1914. Swindon: English Heritage. ^ "Irish Navy sailors and Dunkirk". the Irish Mail on Sunday. Retrieved 16 July 2017. ^ "Toxic Island: The Story of Haulbowline Island" (PDF). FriendsoftheIrishEnvironment.net. Archived from the original (PDF) on 22 March 2012. ^ "Navy to use drones to improve surveillance". Irish Examiner. Retrieved 30 September 2014. ^ "RTÉ News Report on storehouse fire". RTÉ.ie. 12 March 2008. ^ "400 jobs lost in Cork with closure of Irish Ispat". RTÉ News. 15 June 2001. ^ "Irish Independent - Residents alarmed over toxic dump at former steel mills". Independent.ie. 27 June 2008. ^ The Potential To Create A Naval, Or Maritime, Museum On Haulbowline Cork Harbour (PDF) (Report). Heritage Council of Ireland. February 2007. Archived from the original (PDF) on 14 July 2014. ^ "Campaign star Erin falls ill on Irish visit". Herald.ie. 22 September 2008. ^ "Get answers about toxic waste, Brockovich urges". Irish Independent. 1 July 2008. ^ "Your Town - Cork Harbour: Haulbowline Island". Passage West Town Council. Archived from the original on 18 November 2007. ^ "2006 Press Release from the Department of Jobs, Enterprise and Innovation – Major new redevelopment planned for Haulbowline". Djei.ie. 30 September 2013. ^ "Oireachtas Hansard – Written Answers - Remediation of Industrial Sites (Questions relating to OPW working group to manage and develop Haulbowline)". Debate record. Houses of the Oireachtas. 17 June 2010. ^ "Haulbowline bridge repair will help Irish Steel site clean-up - Coveney". The Irish Times. 13 May 2014. ^ "Threats of EU fine prompts clean-up of toxic Cork dump". The Journal. 3 January 2014. ^ "Toxic dump in Cork to be turned into park". The Journal. 22 June 2014. ^ "€61m for Haulbowline 'not enough' to convert old steel plant to public amenity". Irish Examiner. 26 August 2016. ^ "'Unsuitable' Haulbowline plan given €61m". The Times. 13 December 2016.